Four out of Five toilet flushes WASTES water with EACH FLUSH. AdjustaFlush provides 1.65 gallons of water per flush which SAVES GALLONS of WATER PER EACH FLUSH. SAVE 35% of the water YOUR household FLUSHED down the drain last year per each toilet. 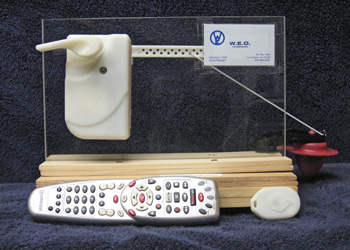 In addition to a unit remote controller, system is designed to operate via universal TV remote frequency from 15+ feet from unit. Operating options will include Smart Phone / iPhone application for the traveler or visitor. Product is made of 90% RECYCLED Ocean Plastic collected and certified point of collection. This chart illustrates a household using 30% of its water for toilet use and / or flushing (6) times per day using a standard five gallon tank.